Following the creation of the EUCERMAT Industrial Network, strengthening the close interaction of the knowledge triangle (academy-research-industry) in the fields of ceramics science across Europe, it has been elaborated and implemented an official charter (General Terms and Conditions). This charter has been elaborated in order to formalize the criteria of members’ selection and the general terms and conditions of the network functioning, and it has been signed by all the involved stakeholders (universities, research centres and companies). The charter is included, as a tool, on a dedicated manual entitled “Industrial Network Charter”. This manual aims to share the good and innovatives practices implemented to the EUCERMAT Industrial Network with the interested institutions of the knowledge triangle by presenting all stages of the creation and the monitoring of a network bringing together all actors of a science fields in order to create a long term cooperative network. The manual “Industrial Network Charter” is now available here. The aim of the Industrial Network is to connect Europe’s best universities, best students, excellent research organisations and first-class employers in the field of Ceramic Science. Those connections will create long-term partnerships and opportunities, not just a temporary cooperation, and actually aspire to strengthen the knowledge triangle in the ceramic field. The academic/scientist teams will work in close connection with the companies members of the network to structure pedagogical contents and define new ways of teaching ceramics science, to answer the industrial needs. In order to constitute the EUCERMAT Industrial Network the partners have established the selection criteria of the industrial partners and the industrial network tasks. Each partner presented at least 2 companies of their closest industrial partners to be involved along the 4 industrial partners already taking part of the project’s activities. Each company, associated with its academic partner constitutes the main ‘functioning cell’ of each country: it guarantees the synergy of functioning in terms of research and teaching. The Industrial Network will be governed by a specific agreement, signed by all the partners, that will last until 2021, well beyond the end of the Eucermat project. The partnership is currently working on it. 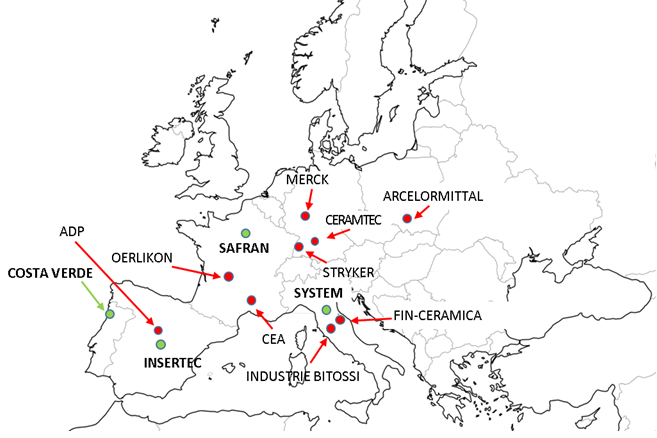 Each year the Industrial Network companies propose innovative research subjects to the EUCERMAT master students in accordance with the expectations of the ceramic material market and in close collaboration with the research organisations, offering them the opportunity to do a 3 to 6 months internship abroad. The list of topics for the academic year 2016-2017 is availabe here.